Your apartment has been the center of your life. Over time, it may seem that every nook and cranny of that space has been used, and you’ve made your mark during your time there. But now you’re ready to move on and move into the next space. Before you can do that, however, you will need to get your old apartment back in shape – not only so you can get your security deposit back in its entirety, but also so you can leave the place in like-new condition for its next tenant. You’ve probably already thought about what you need to do to move your belongings, but you’ll also want to be considerate of your landlord and your apartment’s next occupant. If you’ve pondered “what to do when moving out of my apartment,” consider some steps that will make things easier on you, your landlord and the next person to call it home. 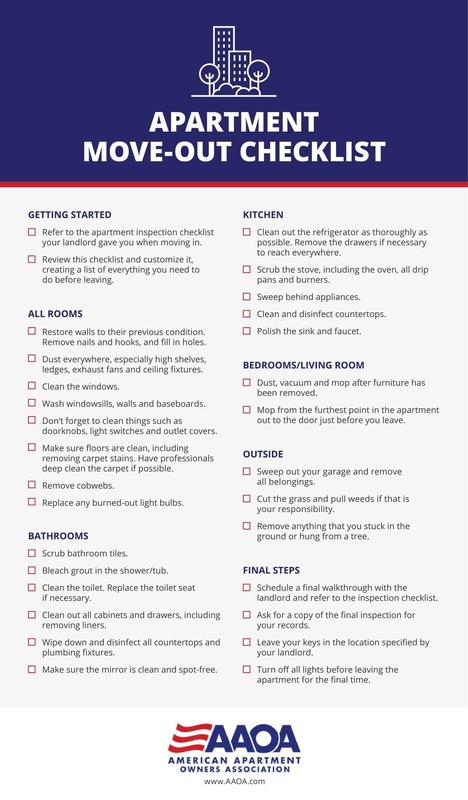 After you pack up all of your belongings, refer to this apartment move-out checklist to make sure you do everything you need to do to get a deposit check back from your landlord and move on to your next place with a fresh start.